Magic Resistance. The marilith has advantage on saving throws against spells and other magical effects. Magic Weapons. The marilith's weapon attacks are magical. Reactive. The marilith can take one reaction on every turn in a combat. Multiattack. 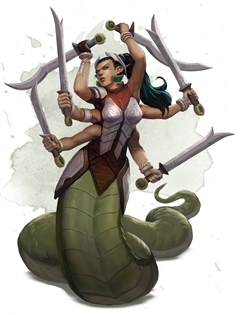 The marilith makes seven attacks: six with its longswords and one with its tail. Longsword. Melee Weapon Attack: +9 to hit, reach 5 ft., one target. Hit: 13 (2d8 + 4) slashing damage. Tail. Melee Weapon Attack: +9 to hit, reach 10 ft., one creature. Hit: 15 (2d10 + 4) bludgeoning damage. If the target is Medium or smaller, it is grappled (escape DC 19). Until this grapple ends, the target is restrained, the marilith can automatically hit the target with its tail, and the marilith can't make tail attacks against other targets. Teleport. The marilith magically teleports, along with any equipment it is wearing or carrying, up to 120 feet to an unoccupied space it can see. Parry. The marilith adds 5 to its AC against one melee attack that would hit it. To do so, the marilith must see the attacker and be wielding a melee weapon. "Reactive. The marilith can take one reaction on every turn in a combat." How is reactive different from being able to take a reaction on every turn anyway, which everyone can do, no? I think the difference is between "turn" and "round." Most characters get one reaction per round, which they can use on anyone's turn, but the marilith can get one each turn if they wanted, so multiple reactions in one round. So basically, as it says, the marilith can just add 5 to its AC against every PC's melee attack on their turn, unless it takes a different reaction on that turn, such as an opportunity attack when the PC moves out of range. Turn & round, a subtle difference but I think you're right. Thanks. But it can only use Parry on *one* attack in each turn, so if a character attacks twice in a single turn, the second attack will be against the Marilith's normal AC of 18. You are correct; the difference is between round and turn; it's essentially able to parry a lot. Also that means multiple attacks of opportunity in a round. All those damn arms. Makes the maralith quite an engaging opponent. A couple of these against a melee focused party is fun. If you boost the stats of them and give them magical swords - flame tongues for instnins - suddnsud they are quite a threat.